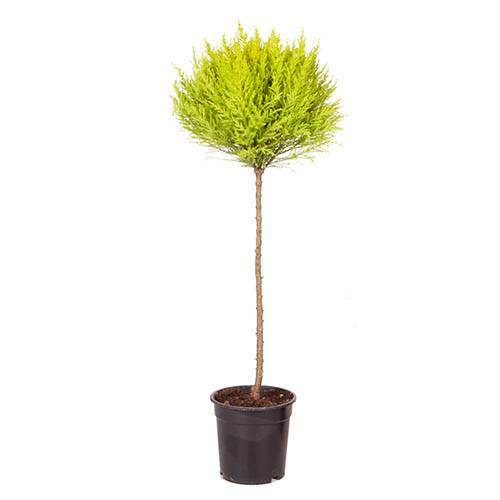 Supplied as shown, fully formed and trimmed, in 17cm pots, 80cm tall total. Clipped into a perfect spherical ball shape, atop a standard form stem reaching 80cm, they add a modern sense of shape and form, as well as year round acid lime yellow colour too! Striking for sure! They look fab as a single centrepiece plant in a small formal square bed, or in pairs in modern pots. Keep watered well in summer, they are hardy, and only need one or two trims a year in growing season. Supplied as an 80cm specimen plant, trimed to shape.